Foot-ankle prostheses can be tiring to wear and produce an awkward, ungainly stride, but the PowerFoot One is the first with battery-powered springs that propel the wearer forward and create a more natural gait. Its built-in microprocessors and environmental sensors enable it to negotiate slopes, stairs and level ground with ease. 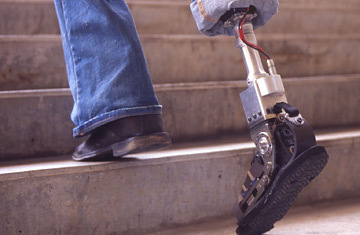 Invented by Hugh Herr, a double amputee and MIT professor, the PowerFoot also recaptures the energy produced with each step.